In order to answer that question, you must first understand why you met this person: some people come into your life for a season and others to teach you a lesson. But everyone comes for a reason. Through careful introspection and honest answers to a few questions, you can recognize your partner’s predestined role in your life. Reflect on these questions to determine the compatibility, quality, and durability of your love. 4. Do you speak the same language? By language, I don’t mean having the same system of speech; I refer to mentality. Do you share the same views and aims? Similar morals and values? Partners who have parallel goals are more likely to remain together than those whose ambitions span in opposite directions. 6. Do you need him? Partners who are meant to be don’t just want each other, they need each other. Theirs is a union that swims a deep ocean. After a hard day, they yearn for each other’s embrace. They need the consoling words of their other half, their healing presence and unique touch. This kind of love transcends wanting—it’s a longing from the seat of the soul. So ask yourself: Do you need him? 7. How does he compare to other partners? Have you brought into your life a partner who’s a copy of a former love? Or does this person hold positive qualities that previous partners lacked? If you don’t completely heal from and resolve the karma of past relationships, it’s likely that you’ll attract a similar companion once more. Compare the patterns of preceding relationships with your present love to ensure that you’re making progress. 8. Can you tolerate his weaknesses? Relationships require a certain degree of tolerance that will undoubtedly test your patience. Can you “stand” all of your partner’s faults? Every one of his bad habits and ill manners? Similarly, do you appreciate his way of being? Can you genuinely adapt to his taste? Unconditional love calls that we accept our partner’s weaknesses in the same way as his strengths. 9. Do you see potential for improvement? Human beings are highly prone to error. The fact is that you’ll never find a “perfect” partner; we all need a bit of work. Every person who walks through your life will leave flawed footprints. What does matter is a person’s potential to improve in time, and what makes someone a good partner is his willingness to better himself each day. 10. Do you share a soulful bond? A soulmate is like the missing piece of our puzzle. Soulful bonds and far and few but when they do occur, they’re obvious to both partners and pass the test of time. 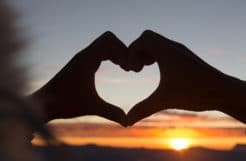 One of my previous entries, “The 10 Elements of a Soulmate,” outlines telltale soulmate signs. Among them is a strong feeling of déjà vu, an us-against-the-world mentality, a curious intensity, and a comforting sense of security. 12. Is he generous? Not just to you, but to others. While you won’t be offered everything on a silver platter, you do deserve a partner who’s fair and gives back as much as he takes. Does he gift you freely with his time, affection, and attention? Such rewards are invaluable. 13. Do you expect miracles? Often you can anticipate the course of your relationship before it unfolds. When I met my husband, I instantly saw the miracles that would manifest between us: taking our first steps into our new home and holding our newborn daughter for the first time. I just knew that with this person, such beautiful things were bound to happen. The right kind of love offers us hope and the right partner makes us believe in miracles. So what blessings do you feel will develop in your own relationship? Sharing chemistry with someone is a rare treasure. But knowing early on whether a partner is right for you is equally necessary. 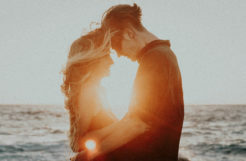 Think about the answers to these 13 questions to discover your partner’s true place in your life and reveal if he’s really the one.